How do we convince students to stretch beyond their comfort zone when writing and speaking in the target language? I believe that teachers have to educate students about proficiency, both on a course level and the task level, so that they are invested in our collective work. Truly, we have a mighty task before us as we lead students on this journey. A standards-based rubric can be a powerful tool for undertaking this work. This year our department has a new standards-based presentational rubric that a group of us wrote over the summer to help guide our work on specific tasks. We spent four intense days at the Massachusetts Foreign Language Association’s Proficiency Academy with Thomas Sauer and Greg Duncan, and each afternoon (and some evenings after dinner…and some mornings before breakfast…) we gathered to peruse existing rubrics and think about how to craft our own. Our resulting “patchwork” product is most definitely imperfect and a work in progress, but having one common rubric forces us to hash out our questions and disagreements collectively, which has great value. I can talk to a middle school Mandarin colleague just as well as a high school French colleague as we try to decide what we mean, exactly, by “strings of sentences” or “highly practiced words” (oh, and the ACTFL glossary helps too). My dream is that by the end of this year, our department will have developed its own lexicon, where we define all the terms in our rubric with examples in English. A new rubric is like a new pair of jeans – you have to break it in to get comfortable. Throughout the first grading quarter this year, I dreaded every presentational assessment because I knew I’d have to face our stiff, unfamiliar rubric again and figure out how to make it fit me. Nothing was as cozy as my old rubric from Terrill & Clementi’s The Keys to Planning for Learning! 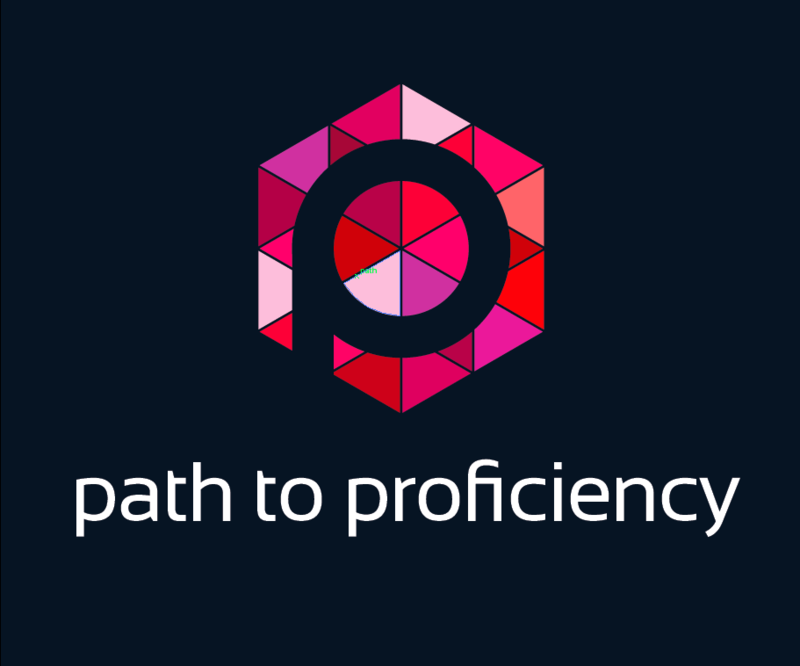 Working with colleagues who shared my struggle made this work easier, and gave me many new insights into proficiency. At my middle school, teachers of four different world languages spent time rating ELL samples and comparing rubric scores so that we could debate and share our areas of uncertainty. As a result, we’ve got a running list of unanswered questions and an emerging glossary of terms to push our work forward. I also brought work samples and our rubric to my regional middle school French PLC so that I could hear what colleagues from other districts had to say about my students work, too. As a result, we are now piloting a different layout of our rubric to make it more comprehensible to middle schoolers. A new rubric may also expose some areas where there are gaps in instruction. Our new rubric mentions posing questions in the “text type” category for Novice High and beyond, which presented me with a challenge. Very few of the prompts that I was using gave students the opportunity to ask questions in their writing. To be perfectly honest, my first reaction to this change was a feeling of annoyance. Here’s a brief summary of the internal monolog running through my head, so that you can see what I mean. So although I was initially a bit miffed that our rubric was the “tail wagging the dog,” it actually got me to improve my instruction so that I can bring students along the path to proficiency. By committing to a new rubric, we were raising the stakes significantly for ourselves and our students. Having a standards-based rubric obligates teachers to ensure that we are providing students with all the tools they need to “level up.” We have to write prompts that let them shine: that push them to show what they know and can do in the language on many fronts: specifically, comprehensibility, vocabulary, text type, and cultural awareness. It’s the tail wagging the dog, but in a good way: the rubric nudges us toward writing assessments that closely match the standards outlined in the rubric, and ensure that we’re faithful to ACTFL proficiency levels. And when we write assessments that match the standards, our students stretch to match those standards and grow their language proficiency. To Finish: A Thrilling Plot Twist! Ultimately, I was won over by the argument that a B for meeting the target ensures that most students will stretch their skills in language class. What else could we possibly want for our students? My students received their first report cards of the school year just over a week ago. While only 2% earned Cs in French, just 26% received As. The vast majority of students (72%) met the target and therefore earned Bs of various flavors. I can say with confidence that most of these students are both unsurprised by their grade, and thinking carefully about how they can exceed the target in Term 2. And I haven’t received an angry parent email or phone call yet! My hope is that as we become more familiar with our rubric, I will sharpen my instruction so that it is more effective, and my students will internalize the rubric expectations so that more and more can exceed the course proficiency targets. In this way, our rubric’s “tail” will “wag” us along the path to proficiency. Rebecca, you never cease to amaze me. I love the work that you and your department are doing, and it certainly makes me feel a little better knowing that you and I have had similar inner monologues this year! Thank you for your honesty, words of wisdom, and the links that you included. You rock. Rebecca! This is so helpful! thank you for sharing your work! It will be of benefit to so many teachers!! YAY!!! This was a wonderful post and so timely as our district is moving to a common rubric. I feel like your post could be the internal monologue of any of our teachers! The link to the rubrics doesn’t seem to work. Is there something I am doing wrong? I would love to see what you all created. We have done such a similar process. Thank you for the inner monologue: it clearly illuminates the struggles of so many of us and your collective work, in your department and regional PLC, in figuring out how to use the rubric, demonstrates the value of persistence. Many of us are learning from the sharing in this blog -Merci et bonne continuation! I love and appreciate the grade A vs. B points and see them as strong discussion opportunities for teachers in our schools. I am planning on sharing these with our department chairs and posing the question… What is a grade suppose to define in your school/department? What makes more sense? Thank you. Hi Rebecca, I echo Timothy’s appreciation of your honesty in sharing your thoughts. I also LOVE the analogy of the pair of jeans… it does take a while. I would be very interested to see how you made your rubrics more accessible to Middle School students. You are a leading light in our field… please keep sharing.